Roughly six years after getting married John B. took part in the Black Hawk and Second Seminole War. He is on a “guard list” of Sergeant Paschal M. Brien and was mustered in at Fayetteville, Tenn. on 18 June 1836 in William Campbell’s Company in the 2nd Regiment of Col. William Trousdale’s Tennessee Mounted Volunteers. [Verner M. Claybourn and Harriette Pinnell Threlkeld, The Claybourn Family (A-1 Business Service, 1959).] John was mustered out at New Orleans on 14 January 1837. In spite of the short-lived enlistment, this group traveled a great distance and endured many casualties to disease. Both Trousdale and Campbell would go on to serve as governors of Tennessee. On the “guard list” in 1836 the name is spelled “Claiborne”, the 1850 census lists the name is “Claiborn”, in 1860 the name appears as “Clayburn”, and in 1870 and most subsequent census reports it is once again spelled “Claiborne”. “Claiborne” is the most common spelling for John and also the one adopted by his children. Some of John’s siblings spelled it “Claiborne” as well, though his parents and extended family used a number of other spellings. Names were frequently spelled in numerous ways, even in the same document, and the variation in spelling was likely due to accident or the inability to read and write. “Claiborne” was not an uncommon name in the South and so it may have been natural for government officials to use that spelling. 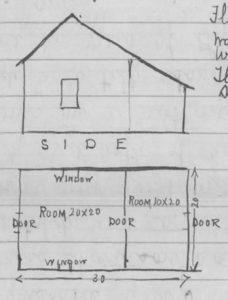 The clapboard house was about 18 feet by 20 feet and had a 10 foot shed roof on the side so that the floor space inside would have been about 30 feet by 20 feet. There was only two rooms in the home, although the studding had been set for partitions. The home was one story high and had a shingle roof and wood floors. The doors and windows were installed by John himself in 1860 and 1861. To build it John and his sons hauled wood from a mill 2.5 miles away. According to the U.S. Southern Claims Commission, John’s Union sympathies were “well known” to other Confederates and as a result he was often seriously threatened and molested by Confederates. A number of John’s relatives were loyal to the Union, including Union soldiers like his brother William Divine Claybourn, son-in-law Jasper B. Scott, and several nephews. Nevertheless, two of his sons were conscripted into the Confederate army. In affidavits with the U.S. government, John suggests they were taken from home by a conscripting party and did not go voluntarily. He also noted that he did not furnish them with any equipment and did nothing to aid them in their service. 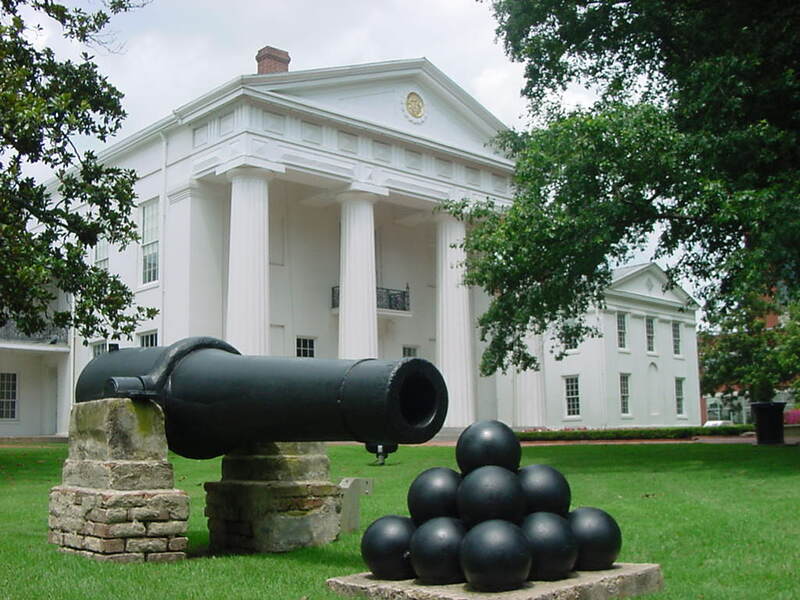 As did many Union sympathizers, John took the U.S. oath of allegiance in February 1864 at De Valls Bluff, Arkansas before Provost Marshall Knox. John faced potential death for his loyalties and therefore he made sure to stay behind Union lines until the close of the war. In addition to providing useful information to Union soldiers about Confederate bushwackers, John also provided much needed food and supplies. In return for vouchers, he gave 300 bushels of corn to Union troops. John served in the new pro-Union government as a member of the 15th Arkansas Legislature from 11 April 1864 through 2 June 1864. Despite the state now being under Union control, he still faced danger from Confederates. He was warned by friends in the legislature that if captured he would be hanged and in the spring of 1864 the rebels took two mules and food from his farm. According to an affidavit from John, the rebels tageted him out of spite. Perhaps in part due to ongoing rebel threats, John left the legislature and moved back to his farm in Prairie County. Then in September of 1864 he and his family traveled to Jefferson County, Illinois to visit the family of his brother William Divine Claybourn. His son John H. Claiborne was also there after having been captured as a Confederate prisoner and subsequently released. It’s likely he wanted to visit in part to see his son. John B. Claiborne soon returned to Arkansas a couple months later at the end of October 1864 but was devastated to learn that the home he had worked so hard to build had been dismatled by Union soldiers using the wood to make bunks and shanties for various regiments in the area, including the 22nd Ohio Infantry Regiment and the 3rd Michigan Cavalry Regiment. John had seen the lumber being hauled on the road to Brownsville and knew by the look of it that it was his own. Although none of the family was home, a neighbor later testified that it was in fact the Union soldiers who had hauled it off. All told there was about 8,000 feet of lumber in the home and virtually all of it gone. At the time John did not ask for compensation, claiming he did not know he should. In part because of the destruction of his home, and because of ongoing dangerous threats to his life, he and his family moved to White County. He also once again served in the legislature from 7 November 1864 through 2 January 1865; and from 3 April 1865 through 22 April 1865.[Ibid.] Despite now living in White County, John represented Prairie County in the legislature. Eventually, on 20 April 1874, John brought a claim before the Southern Claims Commission for $400 for the lumber taken from his home during the Civil War. [See U.S. Southern Claims Commission, Claim No. 18812, submitted to Congress on 20 December 1875.] John estimated the lumber’s value at about $50 per thousand feet considering the hauling involved, but John also noted that lumber was selling for $60 to $75 dollars per thousand feet, and the doors and two windows with hinges were worth about $5 each. Ultimately on 1 August 1864 he was awarded only $150, but even receiving just a fraction of his claim was a victory. Only 32 percent of the claims before this commission were approved for payment. John died just over a month after this decision on 17 September 1874 in White County, Arkansas. All of their children were born in Tennessee. John Beard Hendrickson was born on 17 February 1853 in DeKalb County, Tennessee. He married Sarah E. Jones (1856-1886) on 1 November 1874 in Graves County, Kentucky. They had at least five children, all in Graves County. Following Sarah’s death John married in about 1889 to Nancy A. “Nannie” Boyd (1861-1901). They had at least five children, all born in Graves County. John died on 10 June 1929 in McCracken County, Kentucky. Tina Hendrickson was born in about 1877 to John and Sarah Hendrickson. Edward Hendrickson was born in about 1879 to John and Sarah Hendrickson. Joseph O. Hendrickson was born in about March 1882 to John and Sarah Hendrickson. Nora Hendrickson was born on 1 August 1883 to John and Sarah Hendrickson. She married in about 1918 as the second wife of Jesse Hall “Hawlie” Wallace (1884-1966). Norah died on 18 March 1953 in Graves County, Kentucky. Ona Hendrickson was born in 1886 to John and Sarah Hendrickson and married in about 1902 to Nelson David Cronch (1881-1965). Ona died on 16 October 1950 in McCracken County, Kentucky. Vera L. Hendrickson was born in June 1890 to John and Nannie Hendrickson. James Elbert Hendrickson was born on 26 August 1892 to John and Nannie Hendrickson. He married on 3 May 1916 to Onie Thompson (1889-1992). James died on 11 May 1979 in Marshall County, Kentucky. William E. Hendrickson was born on 6 December 1894 to John and Nannie Hendrickson. He married in about 1917 to Emma “Emmer” Haggard (1893-1952) and was a private first class in the U.S. Army in World War I. William died on 3 September 1975 in Marshall County, Kentucky. Venice Hendrickson was born in April 1897 to John and Nannie Hendrickson. Hobert Shields Hendrickson was born on 6 March 1899 to John and Nannie Hendrickson. He married first on 22 May 1919 to Lucille (1904-1960) and mar-ried second in about 1962 to Elizabeth Sarah Merrick (1899-1994). Hobart died on 21 February 1981 in Marshall County, Kentucky. James W. Hendrickson was born in about 1861 in Marshall County, Kentucky. Records of him disappear after the 1870 census, so he presumably died young. Millie Francis Hendrickson was born on 7 January 1862 in Marshall County, Kentucky. She married in about 1882 to Jones Gregory Hicks (1866-1929). Millie died on 4 April 1939 in McCracken County, Kentucky. Amp Frank Hicks was born on 3 January 1885 in Graves County, Kentucky. He married first in about 1912 to Letha May Mansker (1892-1916). They primarily lived in McCracken County, Kentucky, and had their three children there. After Letha’s death Amp married a second time in about 1919 to Anna May Karr (1886-1972) and they had two children, listed below. Amp died on 8 October 1949. Cornelia Elizabeth Hicks was born on 21 June 1913. She married Harold Brodie Gorham (1908-1979) in about 1929. Cornelia died on 8 September 1991 in McCracken County, Kentucky. Louis E. Hicks was born on 19 October 1914. He served in the U.S. Army from April 1941 to April 1946 and from November 1948 to January 1966. He retired as a lieutenant colonel. Louis died on 6 April 1990 in Calloway County, Kentucky. Eldie Francis Hicks was born on 17 September 1916. He married in about 1939 to Mary Dee Rose (1919-1996). Eldie died on 22 August 1971 in Wayne County, Mississippi. Letha Merle Hicks was born on 2 June 1920. She married John Clancy and died 3 October 2004 in Merrimack County, New Hampshire. Amp Frank Hicks Jr. was born on 17 January 1922 and died on 2 March 2000 in Memphis, Tennessee. Cora L. Hicks was born on 24 March 1886 in Graves County, Kentucky. She married William Orba Mason (1890-1964) in about 1918. They had one child, William Orba Mason Jr. (30 January 1919 – 12 October 2000). Cora died on 4 June 1929 in McCracken County, Kentucky. Willie C. Hicks was born on 19 November 1888 and died on 6 April 1901 in Graves County, Kentucky. Cynthia May Hicks was born on 24 March 1892. She married Herbert Guy Lyles (1887-1956) in about 1910. Cynthia died on 8 February 1915 in Graves County, Kentucky. James Edwin Hicks was born on 28 August 1894 in Graves County, Kentucky. He married Beatrice Harper (1897-1980) on 16 February 1914. James died on 10 February 1972 in McCracken County, Kentucky. Bennie Beuthel Hicks was born on 18 October 1898 in Graves County, Kentucky. She married George Alan Pippin (1896-1967) in about 1921 and died on 10 December 1987 in Rockdale County, Georgia. Martha Annie Hendrickson was born in about 1865 in Marshall County, Kentucky. Martha married James Leonard Alexander (1860-1929) in about 1887. Martha died in about 1890 in Graves County, Kentucky. John William Alexander was born on 29 November 1888 in Graves County, Kentucky. He married Hazel Nicholson (1895-1938) in about 1913. John died on 5 December 1951 in Cuyahoga County, Ohio. Mary Jane Alexander was born on 7 August 1889 in Graves County, Kentucky. She married Perry Kaler (1891-1945) on 19 January 1909. Mary died on 6 December 1979 in Paducah, Kentucky. Mary Tennessee Hendrickson (“Tennie”) was born on 2 August 1867 in Marshall County, Kentucky. She married Ezekiel Asberry “Berry” Ross (1855-1930) in about 1888. Tennie died on 4 April 1937 in Marshall County, Kentucky. Lola Lu Ross was born on 18 July 1894 in Kentucky. She had an out-of-wedlock child with Lloyd Cronwell in 1910, then married Dell Franklin Edwards (1879-1927) on 28 August 1912. Shortly after his death she married Louis “Louie” Cunningham (1886-1934). Lola died on 29 January 1964 in Paducah, McCracken County, Kentucky. Thomas Ross was born in about 1899 in Kentucky. Mattie Gladys Ross was born in about 1904 in Kentucky. Hazel “Haze” Ross (a male) was born on 20 December 1905 in Kentucky. He was briefly married to his cousin Rosie Cronch (1904-1975), daughter of Ona Hendrickson and Nelson Cronch, and granddaughter of his mother’s oldest brother. They had one child, Paul Nelson Ross (1929-1993). He later married Katie (1915-1974). Haze died 31 July 1979 in Shelby County, Tennessee. Emma Hendrickson was born in about 1870 in Marshall County, Kentucky. Records of her after 1880 have not been located. Amelia Catherine Claiborne (click name for separate biographical sketch) was born on 24 March 1836 and died on 16 January 1908. William B. Claiborne was born in 1837 in DeKalb County, Tennessee. When his parents and many of his siblings moved to Arkansas in 1859, he stayed behind in Tennessee. He served the Confederacy during the Civil War as a private in Company H of the 13th Tennessee Regiment, but was killed in that war at Richmond, Kentucky on 30 August 1862. [Alfred J. Vaughan, Personal record of the Thirteenth Regiment, Tennessee Infantry (Memphis: Press of S.C. Toof & Co., 1897). See also John B. Lindsley, The Military Annals of Tennessee: Confederate (Broadfoot Publishing Co., 1996), p. 321.] He is buried at the Battle of Richmond Confederate Cemetery at Bighill, Madison County, Kentucky. William appears to have been the only child of John’s, and indeed the only member of the family by blood, that willingly served the Confederacy. Matilda Francis Claiborne (click name for separate biographical sketch) was born 10 June 1838 and died 10 January 1888. She had one child with her first husband, and five with her second. John H. Claiborne (click name for separate biographical sketch) was born on 20 September 1842 in DeKalb County, Tennessee and died on 28 November 1932 in Texas. Pleasant T. Claiborne was born in 1844. On 24 April 1862, he was conscripted (or drafted) into Company H of the 25th Arkansas Infantry Regiment (called the 30th Arkansas Infantry at the time) under Colonel Charles J. Turnbull, of Little Rock, and Captain W. J. Rogers. This was the same month that the Confederate Congress had passed a conscription law (or military draft) and Pleasant appears to have been caught up in it. One document would later refer to Pleasant as sergeant. This regiment took part in a battle at Perryville, Kentucky, on 8 October 1862. This is the same battle that Pleasant’s brother-in-law Jasper Scott, and two cousins, James Harrison Claybourn and William Pratt Claybourn, took part in on the side of the Union. At some point Pleasant was captured and taken prisoner in Lexington, Kentucky, presumably after the battle at Perryville while his unit was still in Kentucky. Pleasant died on 9 January 1863 and is buried at the Soldiers’ Rest C.S.A. Cemetery in Vicksburg, Mississippi. 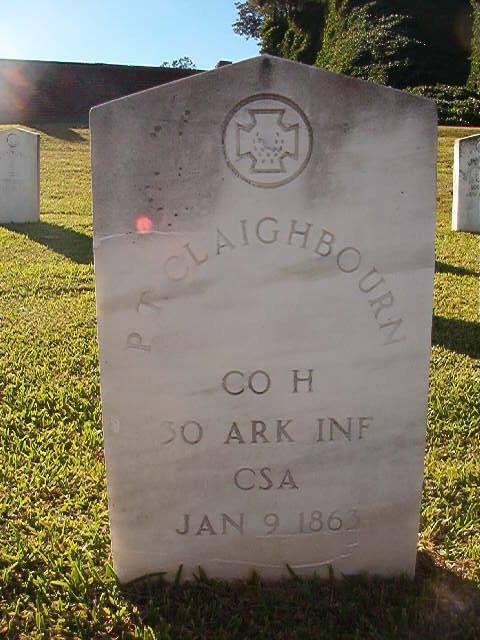 Curiously, his headstone (which may have been replaced later) misspells his name as “Claighbourn”. Arthur Smith Claiborne (called “Smith”) (click name for separate biographical sketch) was born on 3 February 1847 in DeKalb County, Tennessee and died on 8 September 1936. Perlina C. Claiborne was born in 1850 in DeKalb County, Tennessee. She married on 28 January 1875 to John H. Hodges (born in about 1852) and they had two children. It is likely that Perlina died in 1881 because her husband married again on 23 February 1882 in White County, Arkansas, to Louisa Hollemon. Thomas J. Claiborne was born in 1852. He is listed in the 1870 census as 18 years of age and at home at that time in Clay County, Tennessee. [1870 United States Census, Union Township, White County, Arkansas, accessed through Ancestry.com.] In 1880, at the age of 30, he was still single and listed his occupation as dry goods merchant. Samuel B. Claiborne was born on 31 January 1859 in DeKalb, Tennessee. Samuel is listed in the 1870 living with his parents,[Ibid.] and in the 1880 census 22 year old Samuel was living with his brother John. [1880 United States Census, Cane Township, White County, Arkansas, accessed through Ancestry.com.] On 23 October 1897 he married in Jack County, Texas, to Frances Catherine Morgan, who was born on 26 August 1876. He was still living in 1936 when Harriette Threlkeld was researching the family history. Arthur Claiborne, Samuel’s nephew, told Harriette that his Uncle Sam went to Old Mexico to live for a while, reared his family there, and came back bringing quite a few horses with him. [Claybourn, The Claybourn Family.] When he returned to Arkansas he went to Cleburne County and settled near Heber Springs, and later at Clinton in the same county. There he finished raising his family. Samuel died on 29 March 1938 in Van Buren, Arkansas. His wife Frances died many years later on 3 June 1955. Thomas C. Claiborne was born on 13 September 1898 in Jack County, Texas. He married a woman named Louise in about 1923. He served in the U.S. Navy as a Mailman 2nd Class during World War II. He died on 19 March 1974 in Little Rock, Arkansas, and is buried there in Little Rock National Cemetery. Thyra Belle Claiborne was born on 10 September 1903 in Knox County, Texas. She married William David Hancock (1895-1977) on 19 April 1922 in VanBuren County, Arkansas. Thyra died on 20 July 1967 in Wayne County, Michigan. Thyra Oretta Hancock was born on 21 April 1923 in VanBuren County, Arkansas. She married Herbert Wilhite (1914-1997) on 3 August 1947 in Wayne County, Michigan. Thyra died on 13 June 2005 in Cullman County, Alabama. Lexyann L. Hancock was born in 1936 in Wayne County, Michigan, and married Carl Joseph Staber (1935-2000). Arthur Smith “Jack” Claiborne was born in 1906 in Texas. He married Johnnie Dale Russell (1914-1996) on 24 July 1931 in Hempstead County, Arkansas. Jack died on 9 February 1933 in Pulaski County, Arkansas. Mary E. Claiborne was born on 24 June 1909 in Rains County, Texas. She married Cecil Fredrick Burgess (1898-1976) on 4 October 1933 in VanBuren County, Arkansas. Mary died on 19 January 2000 in Starkville, Mississippi. Lexy Frances Claiborne (sometimes called “Sweet Pea”) was born on 3 November 1911 in Lynn County, Texas. She married Lawson Hulan Simpson (1908-1973) on 24 December 1938 in Pulaski County, Arkansas. They were the owners and operator of Simpson’s Store in downtown Clinton, Arkansas, for fifty years, with Lexy retiring at the age of ninety. Four days after her retirement she started working with her son-in-law John Hargis at the Huddle House in Clinton for four more years, officially retiring at the age of ninety-four. She was a big Clinton Yellowjacket and Arkansas Razorback fan. She was a charter member of the Clinton B&PW Club, a member of the Idle Hour Bridge Club, and a member of the Clinton United Methodist Church. In 1998 she was selected as the Clinton High School Distinguished Alumni. To honor her for her fanatic loyalty to the Yellowjacket basketball team, she was asked to toss out the first basketball to open Yellowjacket Arena in 2006. Lexy died on 14 July 2010 in VanBuren County, Arkansas. Sunny Simpson was born in 1947 in VanBuren Co, Arkansas. She married John Nathan Hargis (born in 1944). One of their sons, John Lawson Hargis (born in 1975), was a noted competitive swimmer and swimming coach who won an Olympic gold medal in 1996 as a member of the U.S. 4×100 medley relay team. Ima O. Claiborne was born on 6 May 1916 in New Mexico. She married Charles B. Oldham (1917-1995) on 30 June 1937 in VanBuren County, Arkansas. Ima died on 21 August 1992 in Jacksonville, Arkansas.